What do you think Pat? Bell & Howell sold their HIFI division to Columbia in 1957 or 1958, I think. Columbia renamed the B&H consoles "Columbia Masterworks". The consoles are exactly the same as the Bell & Howell. They do not come up that often. That one is the full blown console with all the goodies, including the scope, timer/clock, and tape player. If you don't want to snag it, Ken, maybe we can work out a deal for you to pick it up for me? It will cost a pretty penny to ship east, but I already let one slip away last summer in St. Paul, MN because of shipping cost. I've been looking for one of those for years. I work for Bell & Howell and have a small collection of their 16mm projectors, and 35mm SLR's, but want to add one of those consoles to complete the group. I thought it looked like a B&H! I don't have room (or funds) for it right now. If you can make a deal with the seller I can pick it up and help get it shipped to you Paul. That's the real deal and the top model as well. Even has the stereo conversion and extra speaker. Spare no effort in getting that thing. It's the best configuration they ever offered and exceedingly rare and collectible. Wow!!!!!! I thought that external speaker cabinet was a little stool to sit on. Don't see a price on the console either. It's in LA so they probably want a small fortune for it. that is definitely a fly down and drive it home piece. Truthfully this piece is all about style and quality. The console is for all practical purposes the finest mono instrument ever produced. The stereo feature only works for direct playback from the reel to reel player. 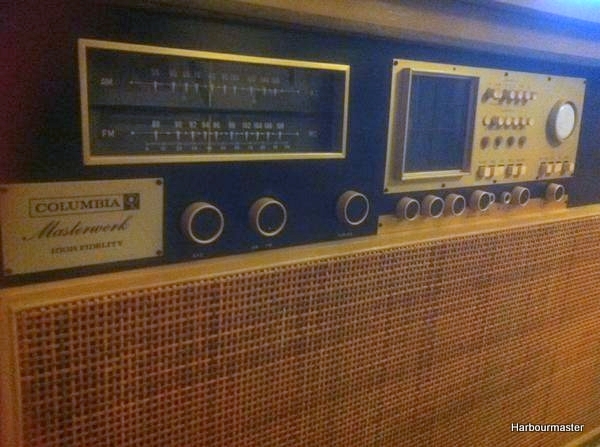 To prolong the sales life of this unit into the stereo age the factory installed a second amp in the unit and the included the small extra speaker so that tapes could be played in stereo. The speaker is so small because it can be stowed inside the console (from the back) and stored or played there. This is only a marginal stereo solution though, as the second amp does not match the main amp nor is it controlled by the main preamp. either way, a unit like this is a rare find. especially in this condition. I'm not crazy about any massive looking console unit of any brand. I much prefer a smaller console like my Imperial Berkshire that packs one helluva punch from a small cabinet. 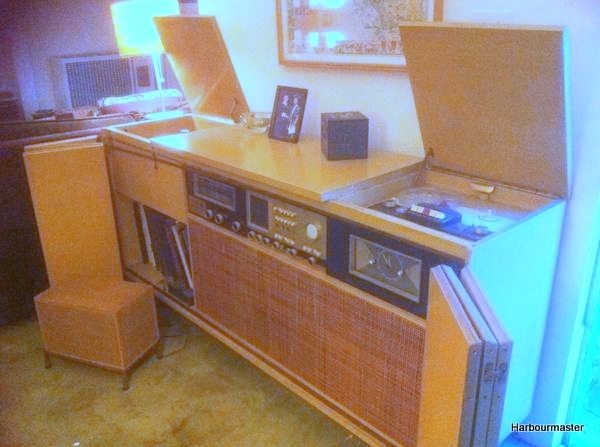 Also, I had one console with a reel to reel tape deck in it (1956 RCA Victor Mark I), and I will never buy another console with a built-in tape deck. A much better alternative is to use an external reel to reel like a 1970s Akai four track stereo deck. I have one and it sounds simply fabulous playing it through my Magnavox consoles. Larry, we all have of our opinions of what we like and what we hate, that's what makes us great. An Imperial or Berkshire is a nice console, not my particular cup of tea, but nice nonetheless. 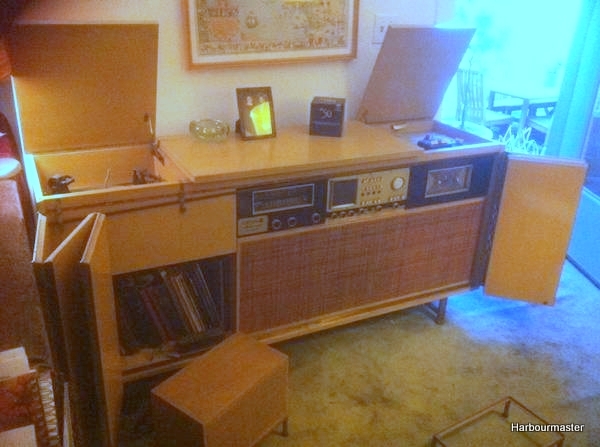 Although this unit might look a bit clunky or industrial, it is a vintage piece of mid 50's HI-FI. Also, the whole RTR thing, I would not let that scare me off. I mean why put a solid state RTR unit together with a tube console. Sounds like blasphemy to me... again, just my opinion. These particular consoles, Bell & Howell - Columbia Masterwork's have a unique pedigree. Their cabinets were designed by Paul McCobb. He was without a doubt the most noted of all Mid Century Modern designers. Think of him as the Frank Lloyd Wright of his field. These consoles were essentially hand made and individually serialized. I've never seen one with a number over 1000. They are rare, of high quality, and collectible as a piece of furniture from the most sought after designer of the period. I know they're not for everyone, but even if they're not for you, you should still have an appreciation for their value and significance (if you ever run across one you could make a tidy sum flipping it ). I own the model exactly like this one, but without the front folding doors. It is so heavy that it's rediculous. Think large upright piano and you'll be close to the weight of this beast. If everyone collected the same thing it would be a pretty boring world!!! I did a little color correction on these images so that you can get a better idea of what this thing really looks like. Note in the lower right of this photo what appears to be a second base for an extension speaker! I have always been interested in these consoles ever since I saw this LP cover 40 years ago! Hugh Hefner would be proud to own this classic!! I'm usually sound asleep at this hour on a Saturday but right now I am having some coffee, and preparing to head up the freeway to Los Angeles with my son James to pick this console up for amglow... will report back in a few hours!